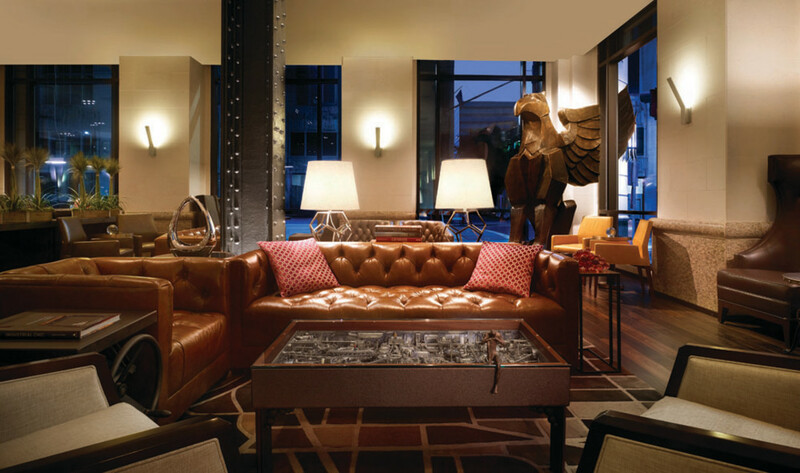 Tapping local artists, makers, and the building's historical pedigree, the JW Marriott aims to stylishly represent Houston. 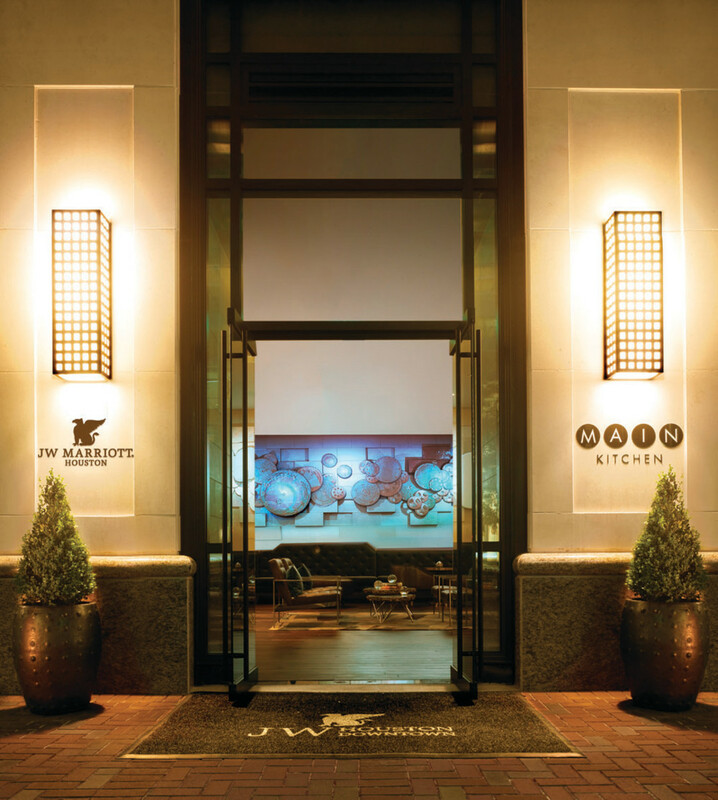 Rounding the corner of Rusk onto Main Street, where the bustling front entrace to the new JW Marriott Houston Downtown is located, the first thing that jumps out at you is an oversized metal wing. 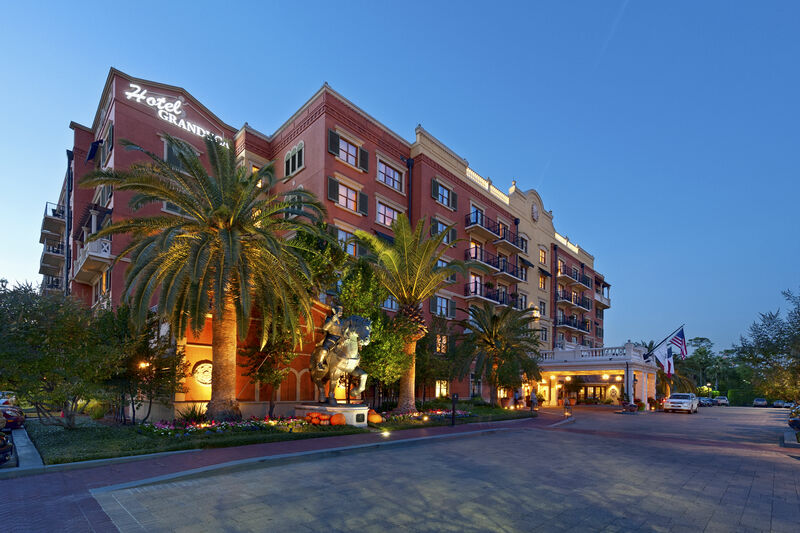 Jutting out from an artistically rendered griffin scuplture in the corner of the Marriott's lobby lounge, the wings theatrically extend through the structure of the building and sweep majestically out from the exterior structure. Smartphone addicts are advised to watch their step. 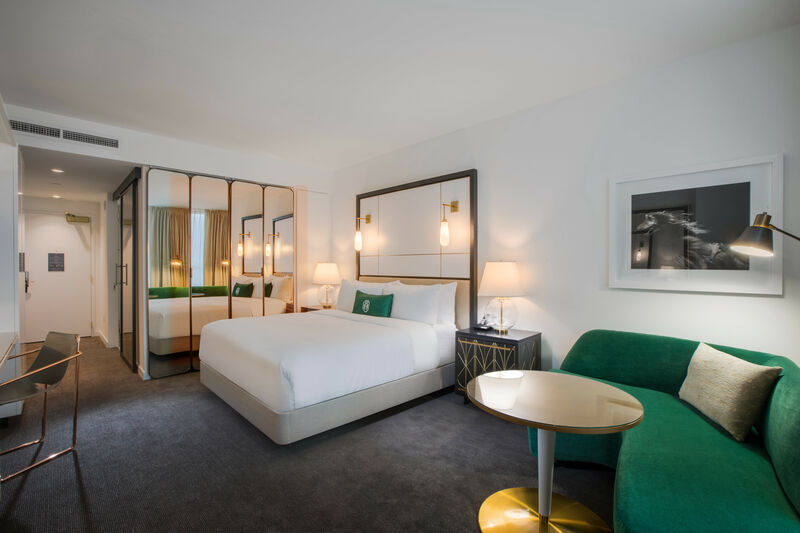 The griffin, a play on the JW Marriott icon, is just one of several sophisticated touches made throughout by developer Pearl Hospitality in its $80 million makeover of the 1910 building. The 13-foot griffin — a mythological creature that is half eagle and half lion — was created over 950 hours by Dallas sculptor Oldham out of bronze and steel and weighs 1,500 pounds. Elsewhere in the 806 Main Lounge, a custom coffee table by Oregon sculptor Jud Taylor contains a world of gears and assorted metal parts as well as tiny human figures. The sculpture that greets guests upon arrival is a three-dimensional screen onto which a projector casts moving images — by day, a subtle wave, with more dramatic patterns emerging after the sun sets. It's the second permanent installation in the world from the German collective, and their second major work in Houston following the jaw-dropping "Spectacle" at Rice University in 2012. 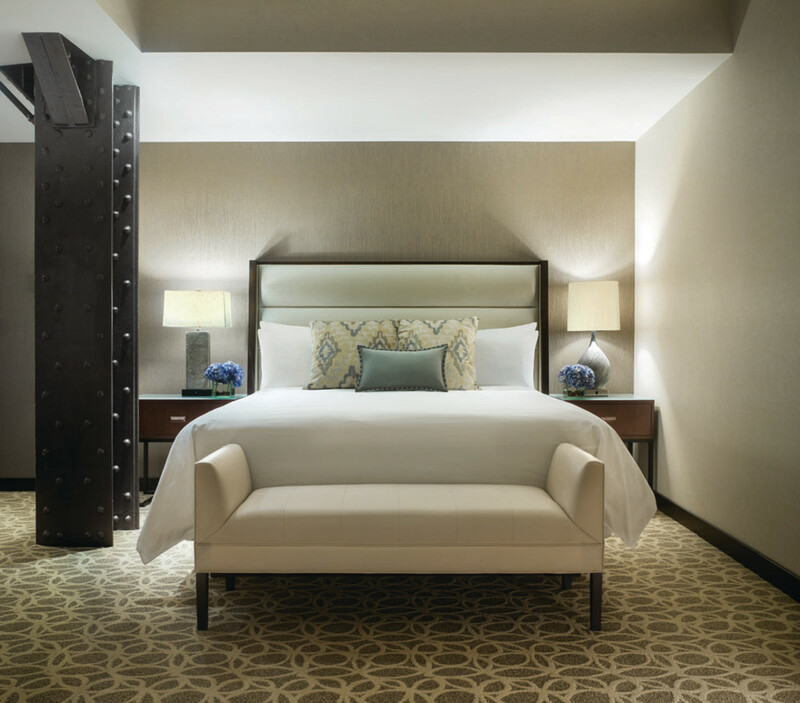 Throughout the lobby, hallways, and even inside some guest rooms, the original iron support beams have been uncovered and made a central design feature as a nod to the hotel's history. Made by the same workers who built the Brooklyn Bridge, the workers' original stamp is still visible on some of the supports according to Natalie Wiseman, JW Marriott Houston Downtown director of sales and marketing. 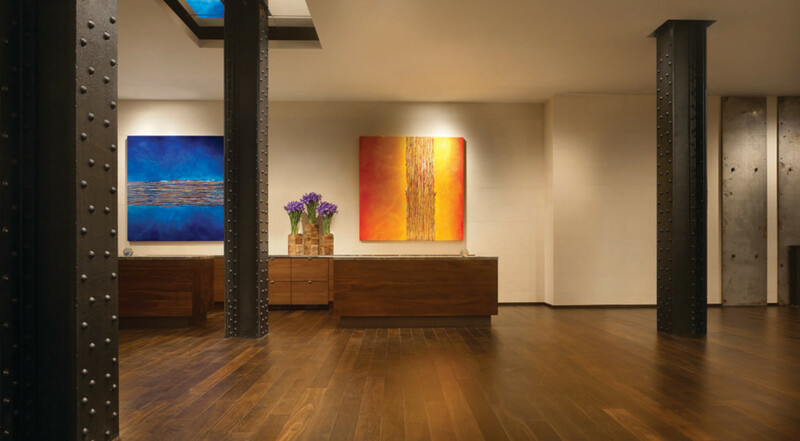 Among the local artists whose work is on display in the hotel's permanent collection are Taft McWhorter (whose canvases, both named Untitled, are shown above), Nicola Parente, Mario "GONZO" Figeroa, Kelley Devine, Allison Hunter, and Richard Blanco. 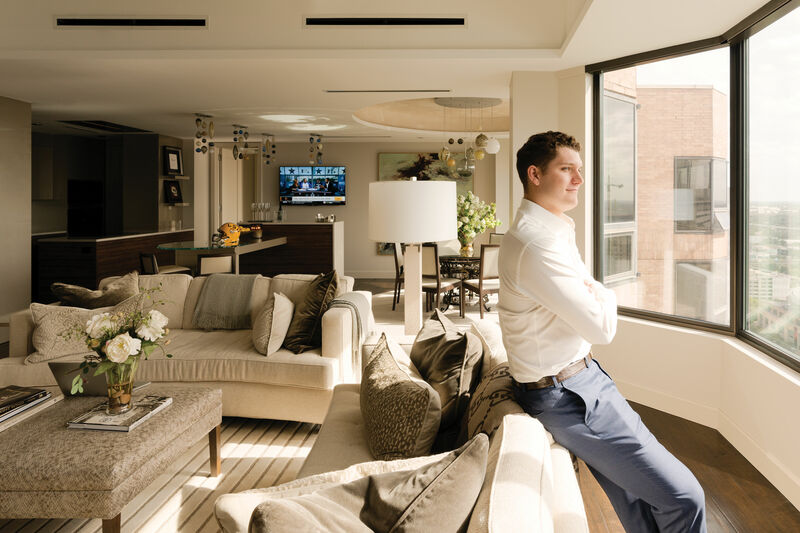 The live-edge boardroom table in the executive suite, shown above, was designed by Dallas's Paloma Creations, while the 14-foot walnut community and tasting table inside Main Kitchen was built by Houston's George Krause and Jose Martinez of Made @ New Living. Described as the "most magical room in the entire building" by Wiseman, the ninth floor features the original boardroom of the building's original builder and owner, Samuel F. Carter. 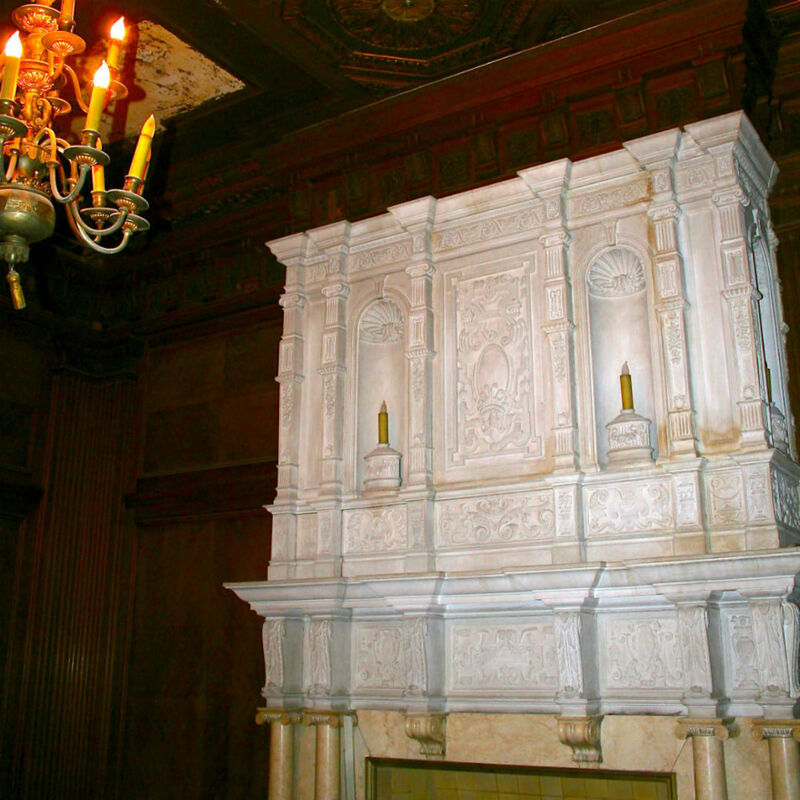 Built in 1929, the room features original marble floors, stained glass windows, mahogany paneling, and a dramatic fireplace. Though still being renovated, by mid-November the room will be used for private dining and intimate weddings.